Designing interior wayfinding graphics for the American Museum of Natural History's dinosaur gallery at COSI. The MKSK team was challenged with creating interior wayfinding graphics to draw visitors at the Center of Science and Industry (COSI) into the new American Museum of Natural History's Dinosaur Gallery. The MKSK design team developed a concept where a sculptural flock of suspending, prehistoric birds and life-sized dinosaur silhouette wall graphics lead visitors to the gallery entrance from the main COSI lobby. A life-size titanosaur graphic and gallery identification on the lobby wall greets visitors to the main exhibit. 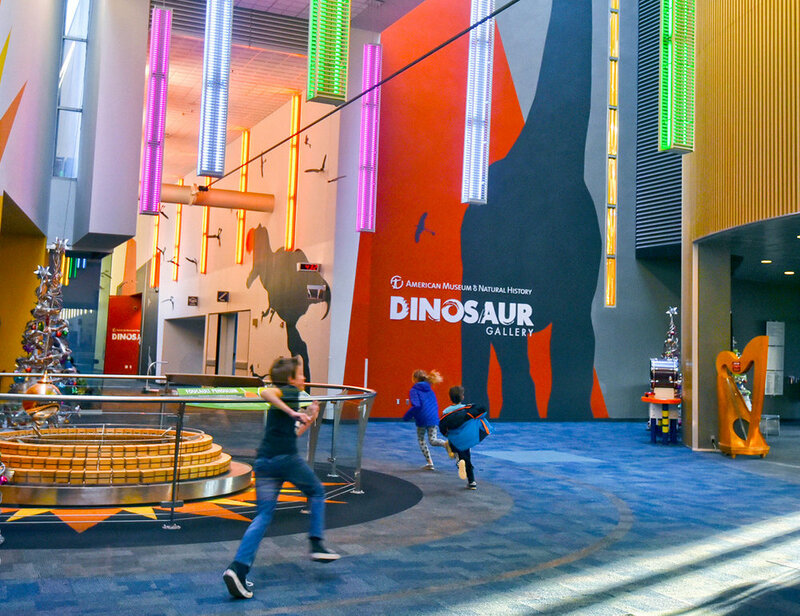 The final design utilizes the existing exhibit color palette and customized dinosaur silhouettes that are representative of the dinosaurs found within the gallery space.